The A.V. Club has written about Cinefix’s 8-Bit Cinema series, which translates popular movies into the style of classic video and computer games, before. The company usually makes savvy choices as to what genre to turn a film into—Mean Girls as a visual novel, Kill Bill as an action-platformer—but its latest video goes above and beyond, transforming David Fincher’s thriller/mystery Se7en into a classic adventure game. The “game” follows Detectives Somerset and Mills as they investigate the film’s various gory tableaus, while a moodily great chiptunes soundtrack pulses in the background. The detectives dust for prints, investigate clues, and of course open boxes as they pursue John Doe. Besides ably following the film’s plot, the video also captures that sense of lonely melancholy that was central to the old adventure game experience, as Mills and Somerset go about the work of applying inventory object to problem in classic Sierra or LucasArts-style. 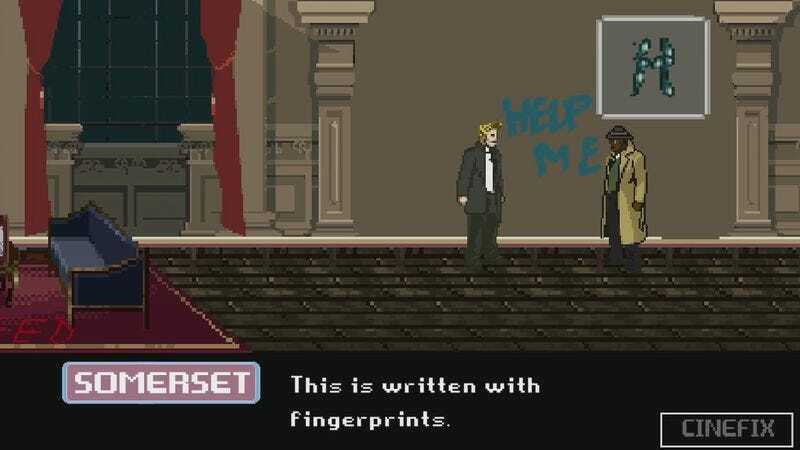 In terms of visuals, the creators admit that the video is much closer to 16-bit than 8, with some of the spritework looking like it would fit in perfectly with other console-based adventure games like Clock Tower or Metal Gear creator Hideo Kojima’s Blade Runner homage Snatcher—albeit with fewer light-gun sections and more library-investigating, Dante-reading action.